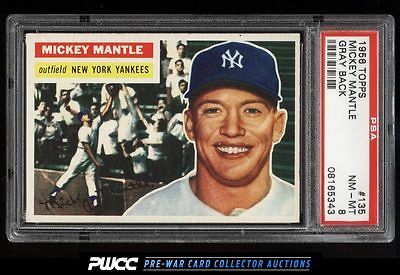 *Auction 7, Vintage Round 2* Impressive high grade '56 Mantle on the auction block this month. A beautifully preserved '8' which boasts pin-point sharp corners, crisp edges and undeniable NM-MT card stock. The color and focus are exceedingly impressive throughout. An all around pretty card which is deserving of attention. One of nearly 20,000 cards, lots, and sets up for bid in our 7th Auction of 2016. Click on the link above to view the other PWCC auction lots.